​When I started researching this blog post I became acutely aware that there's a big lack of information about how to actually get started swimming when you're a complete beginner. Sure, there are about a thousand “beginners’ articles” that tell you to do this drill and that, or to follow this training schedule or that. What most of them fail to take into consideration is the diversity of challenges that different swimmers have. There’s no one-size-fits-all prescription that will work for everybody. For example, you might come across articles telling you to focus on your breathing when first starting out. But if you're problem is not actually with breathing but incorrect body position, those breathing tips and endless drills are not of much use to you. So the question is: how can you as a beginner possibly know which advice to follow and which not to? Well, I'm going to make a bold promise here. I'm not going to give you a single drill or workout. What I'm going to give you is a system. And if you follow this system I promise you, within three months of starting swimming you’ll see some really dramatic improvements. If you don't, please get in touch and I'll arrange to personally help you somehow, through remote coaching or whatever it may be. And I'm serious. Now let's have a look at the system. Before we get stuck in: Grab this checklist for a nice and brief overview of each step. Print it and keep available to tick off the boxes as you follow along with the system. Nothing is going to help you more than becoming a consistent swimmer. The other side of the coin is, a lot of the improvements you make will quickly disappear if you let your consistency derail. I recommend that you swim at least twice a week, but three times a week is preferable to get you off to a really good start. Once you get a good foundational swim technique you can scale back if three times is too much for you in the long run. To make sure that you really do get in your planned sessions, there’s a surprisingly simple solution. Schedule it! 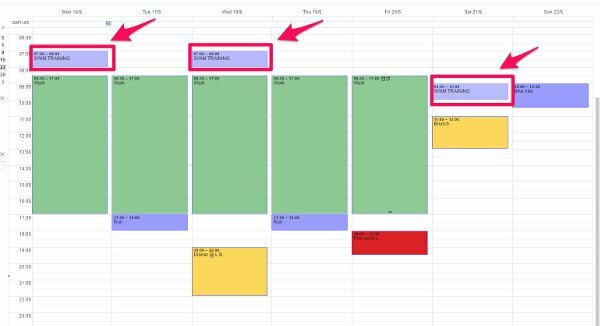 Use whatever scheduling tool you like. Google Calendar, your phone, a notebook... Whichever tool you use, schedule each swim session you will do during the coming week and stick to that schedule. If you don't treat your swim sessions like booked appointments you are inevitably going to miss some of them. The same could be said for training sessions in general, but I’ve found that it’s especially true when starting out in swimming. It’s just far too easy to become demotivated when starting out, and swimming seems like such a daunting challenge. Many beginner triathletes believe that coaches are just for semi-pros that have been in the game for a long time. Nothing could be further from the truth. I would say that the most important phase of your triathlon journey for getting help and support of a coach is when you’re just starting out. Especially in swimming, and especially if you’re completely new to it. Your coached swimming sessions should be either one-on-one or very small group sessions, so you get all the individual feedback you need. By getting help from a coach, you’ll make improvements much faster compared to just winging it on your own. The enjoyment of seeing such rapid progress alone will be more than enough of a return on investment. Not to mention that if you go at it alone, more than likely you’ll form some bad swimming movement patterns. These can be difficult to break out of later when you have improved and want to start getting the smaller details right. Repetition ingrains habits, both good and bad. By having a coach, you’ll ingrain good habits from the get-go, and avoid later frustration. Finding a coach shouldn’t be very difficult. A simple google search will usually return plenty of options. Asking at your local pool is another great option. Maybe even better, ask at a local triathlon club. They’ll be able to recommend coaches who are used to working with triathletes. There’s a difference between coaching swimming alone and coaching swimming for triathlon. You could also sign up for your local masters’ swim class. Although I wouldn’t recommend replacing on-deck coaching one-on-one or in a small group with masters’ swimming alone (you’ll likely not get the amount of individual feedback you need), some of the other swimmers might agree to help you out a bit. Ask if somebody wants to show up a bit early to give you a few pointers before the class starts. If that fails, at least you might get a few recommendations for good coaches in your area. To get the most out of your coaching, I recommend that you should have a coached session every other week if you swim twice a week. If you swim three times per week (or more), you’ll get the best return by having one session each week be coached. Make sure to tell your coach what your goals are when you first meet (e.g. finish my first sprint triathlon) so they know how best to coach you. Also, remember to ask for a few main things (not a long list, two or three is plenty) to work on until your next session. Then work on these things when you practice alone in-between coached sessions. This will speed up your development even more and make sure you get the most out of your being coached. If you get this kind of on-deck coaching with individual feedback for three months, you’ll have the foundations down to keep at it on your own after that. That said, you’ll obviously still make much faster improvements with a coach than without, but the point is that once you have the right foundations in place, you can improve a lot just from swimming on your own. It’s very difficult to improve your swimming if you don’t know exactly what your swimming form should look like when you’ve mastered it. By gaining this kind of awareness, you’ll also be able to much better understand the instructions of your coach and make faster improvements. To make it very easy for you to get this knowledge, I created a quick video where I talk about the main aspects of good swimming form that you should be aware of. Go ahead and watch the it right away. Rotate your body from the hips all the way to the shoulders with each stroke. Your head only rotates when you breathe. Start the stroke (the “catch” phase) with your arm reached out fully in front of you. Your arm should also point slightly down. During the “pull” phase, keep your elbow high and bent. There shouldn’t be any movement of your arm towards the sides. The palm of your hand is directed straight back so all power you generate brings you forward. Your hand exits the water only when your arm is fully extended back to the level of your hip or beyond. Breath out all the time that your head is in the water. Do this by blowing bubbles from your mouth and nose. On every second or third stroke, rotate your head along with your body and breathe in. Don’t lift your head or actively change the position of your head. Just let the rotation bring your face out of the water. Another thing you can do to learn what good swimming form looks like is to watch other swimmers in the pool. A good exercise is to try to analyze what other swimmers do well, and what they could improve. Finally, Youtube is a treasure trove of great videos analyzing swimming form at various levels. Just dive in (pun intended) and start watching, and you’ll soon learn all the ins and outs of great swimming mechanics. This step can be a real game-changer. Especially combined with steps 2 and 3. Getting a video recording of your swimming form makes you acutely aware of your current swim technique. This is an essential step for improving your swimming form. You won’t change flaws you don’t know about, right? Also, video recordings will allow your coach to give you even better and more specific instructions. Not to mention the fact that your understanding of the coach’s instructions will improve, enabling you to execute much better on those instructions. The video recordings should be as comprehensive as possible for you to get the most out of it. This means that you should get underwater footage from the side, rear and front. Footage from above the water should also be part of it. Getting yourself filmed requires a camera capable of underwater recording. The most obvious choice is a GoPro camera, but there are plenty of other alternatives as well. For example, you could very well buy a waterproof case for your smartphone and use that to do the recording. There are whole bunch of cases for a wide range of prices out there. The one from LifeProof is a safe bet. You don’t necessarily need to buy a camera or waterproof case yourself. Chances are your coach already has access to a camera for this exact purpose, so just ask him or her about it.If not, GoPros are getting so common these days that you are more than likely to find that somebody you know has one that you could borrow. Just ask around! Use a tripod, selfie stick or home-engineered skiing pole mount for the camera. This way, the person filming can walk on the deck as you’re swimming, and keep the camera submerged in the water for the side shots that follow you all the way from end to end of the lane. A mount like this also makes it easier to take the front and rear shots from the short end of the lane, although it’s possible to do that without a mount. Ideally, you’d want your coach or somebody else who’s used to filming swim technique videos to do the filming for you. If that’s not possible, then it’s ok to have any friend or family member do it. In that case, just instruct them to take stationary front and rear videos from the short edge of the pool. For the side view videos, they’ll walk alongside you next to the pool as you’re swimming, using the mount to get underwater shots of you swimming from end to end. Above-water videos can be taken both from the short end of the pool and from the side as you’re swimming, as just described. Now that you have your videos, go back and compare to the videos you watched in step 3, and it will become very clear to you what you’re doing right and what you need to work on in your swimming form. Also, show the videos to your coach (if (s)he wasn’t the one doing the filming) to get professional feedback. Shoot new videos every 4-6 weeks to monitor your progress. There are a lot of swimming tools available for giving your training a push even further in the right direction. 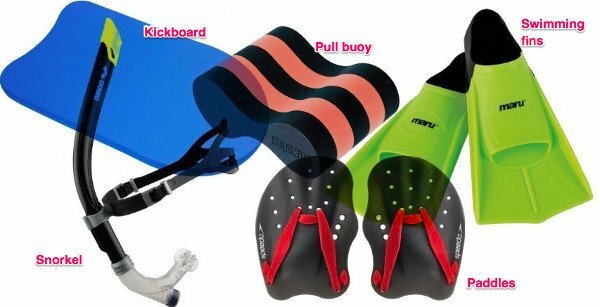 These training aids include kickboards, pull buoys, fins, snorkels, paddles and many more. Opinions on to what extent they should be use vary. On the one hand of the spectrum are people that swear by them and claim that you can’t live without them. On the other end are purists who think these tools are just crutches. In my humble opinion, the truth falls somewhere in the middle. You shouldn’t overly rely on them, but don’t categorically refuse using them either, because they can be a big help.The one thing you should not do, is to just randomly buy a bunch of tools and throw them into your training without knowing what you want to accomplish through it. If you want to become a better swimmer fast, there’s no place for training entropy. What you should do is to rely on the advice of your coach, and also the awareness of your own technique that you have now developed. With your weaknesses identified, you can use the right tool for the job to correct each weakness. Whatever training aids you use, the whole idea is usually to isolate the thing you’re working on (for example your stroke) by using different tools that allow you to take your focus off of everything else (for example kicking and breathing). Use swimming fins and a kickboard, or just swimming fins. There are plenty of drills using these tools for improving your kick. You can also leave out the fins, but usually that happens when you become a bit more advanced. Use a pull buoy and/or a snorkel. This will help you take kicking and/or breathing out of the equation and focus only on your stroke. Paddles can also help with this, since they can work to improve your “feel for the water” with the added resistance. Don’t use huge paddles made for strength development though. They come with a greatly increased injury risk. Stick to smaller paddles geared towards technique training. Swimming fins are the go-to tool for practising good body position. They help lift your legs, but still require you to keep the tautness that might be lost if you just used a pull buoy for that purpose. To practise the extension and reach of your body alignment and tautness, add a kickboard and you’re all set. Use either a pull buoy or fins to take focus off of staying afloat. For some breathing drills you might even use a kickboard (extended in front of you with just one arm). The final step of your fast-track to swimming greatness is to vary your paces. Avoid mindless lap swimming at the same, constant speed. It’s very low-value training. When you’re completely new to swimming, most or all of your swimming will and should be regular swimming or swimming drills of just 25 to 50 meters (or even shorter). Occasionally you’ll go a bit longer, but at this stage the goal is not to develop great endurance or fitness. It’s to develop a good foundational technique. If you’ve been following the guidelines of this system, pretty soon you’ll get to a point where there’s no point in just doing pure technique drills all the time. Don’t get me wrong, as a beginner you should always think about swimming with good form. But once you start getting the very foundational elements down, some of your technique training will consist of just swimming, without doing any specific drills, and not necessarily pausing every 25 or 50 meters. You’ll be forced to think carefully about your swimming form when you’re swimming faster, since brute force or fitness won’t get you far. Improving your technique is what will get you big gains in speed. Having to think about your form this way will make you start executing better and better swimming form. You’ll find your limitations at different speeds might be different. For example, at slower paces your legs might sink (indicating a body position limitation), whereas at faster paces you might not breathe as well as you should (a coordination or movement pattern limitation). Finding these different limitations at different paces will help you better structure your swim training and allocate time optimally to various aspects of your swimming form. For example, if you’re training for a race with a very short swim, you might want to focus on limitations that show up at faster paces (which you’ll go at in the race), and vice versa. I won’t get into any more detail than this here. Just understand that your training will be much more effective by varying your paces and interval distances compared to constant-pace lap swimming. You don’t need to be very systematic about it at this stage either. Just go by RPE (rate of perceived exertion) and mix it up with easy, moderate and hard paces. The checklist offers an example workout that you can use if you don’t feel like leaving it to your own imagination. Congratulations! You’ve done some massive improvements in your swimming compared to where you started. You feel confident, motivated and you’re actually enjoying swimming now. Swimming is like most other skills. Try to throw things at a wall to see what sticks and you just might get lucky and actually find something that works. But to be honest, you probably won’t. Take a systematic approach on the other hand, and you take complete control of your improvements. So I really hope that you take this approach we just went over in this post and apply it to your swimming. Before heading off: Grab your checklist of this system here. Take control of your swimming development. Don’t throw things at the wall to see what sticks. Get the CHECKLIST: "Rapid swim improvement: A 12-week system"
I want to see Rapid Swim Improvement in just 12 weeks!